Marisa Seguin's cute, colorful, charming work always brightens my day. Her work is a perfect visual for the concept of celebration. 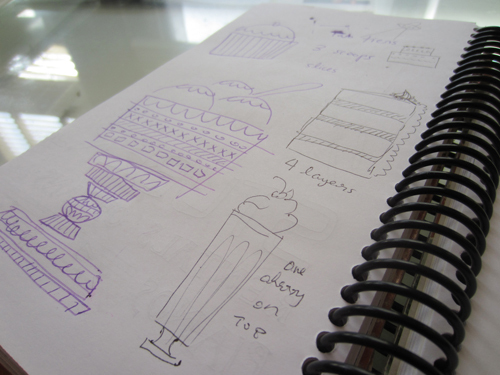 Happily, she's participated in our birthday interview and gave us a look at her sketchbook phase! I've had some cake doodles (and other sweets) kickin' around in my sketchbook for a little while and thought it would be a fun opportunity to spiff them up. 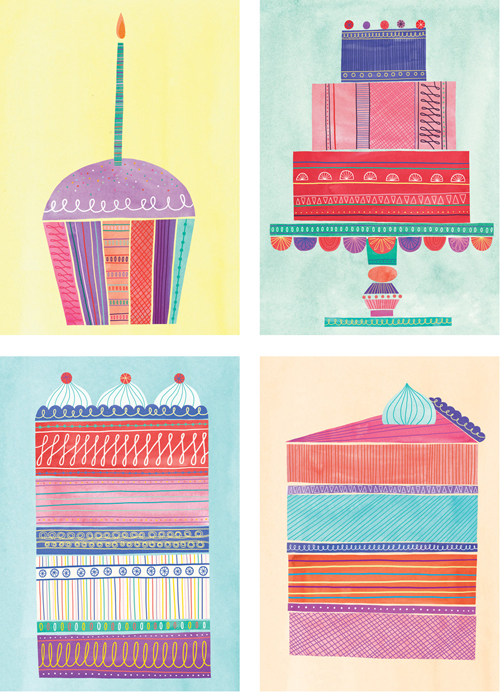 I love illustrating sweets but especially cakes because they are so customizable and fun to experiment with. Fun print/pattern and colours lend themselves perfectly to these confections, it's easy to get carried away with the details. Structure/palette-wise I think it fits right in with the rest of my work. I tried to push myself a bit with the different pattern-work used within the cakes since I was planning on keeping the compositions super simple and knew the extra detail wouldn't be too distracting. I'm looking forward to a fun swap for Ten Paces and Draw this week (I keep sketching ideas and then not wanting to give them away because I want to finish them myself!) and have also been making some (verrrry slow) progress on some new maps for my Here & There series. My birthday always falls on a national holiday in Canada so when I was younger my birthday meant no school/work and fireworks! Now that I'm living in Milwaukee and you guys aren't so into celebrating Canada Day (what's up with that?) I always like to go out to eat with friends on my birthday. A few years ago some of us threw a surprise birthday party for our friend Liz. We gave all of the guests a theme with 5 facts and played our own version of The Unbelievable Truth. (Bonus points were awarded for delivering your speech in a British accent). Many many Cthulhu cupcakes were also consumed. For more of Marisa's work, you can check out her site and follow her on Twitter! She also has a great trend/inspiration blog here!